To truly enjoy the best experience in Prague, we recommend staying in one of the many Airbnb apartments in the city. In case you are not familiar with Airbnb’s services, it’s a worldwide operating platform for short-term rentals from the owners directly to guests. You can either rent a whole apartment for yourself, or just a private room if you are short on budget. OUR TIP You can go directly to Airbnb.com and start searching for your dream house for Prague holidays. If you register using the button below, you will receive a free $20 voucher for your first booking! Space – Usually the apartment sizes are around 60+ square meters. In a hotel you would get a smaller room. Price – It’s much cheaper than renting a hotel room, with prices starting at $50 per night. Location – You can rent a place literally in the heart of Prague, within walking distance of all the major tourist spots. Feeling – You will experience Prague like a true local. Of course there are also some disadvantages – there is no breakfast, room service or extra facilities like in a hotel (gym, swimming pool). So if you are the type of person who loves to be waited on hand and foot, we recommend staying in one of Prague’s hotels. 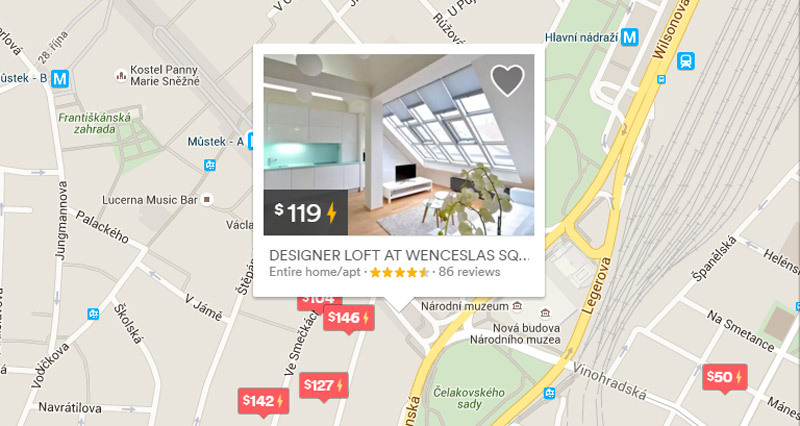 Currently there are about 300 apartments in Prague listed on Airbnb. To make it easier for you we have created a hand-picked list of the TOP10. We focused on the most popular Prague districts right in the downtown area. We have considered the following factors during our research – location, price per night, reviews and design/feeling of the apartment. This loft has recently undergone a complete renovation and it has been reconstructed with a considerable attention. The location can hardly be any better since the apartment is only 40 meters away from Wenceslas Square. In this apartment you will feel like you’re in a warm and cozy traditional family chateau, but in the heart of Prague. Cozy little apartment of 37 square metres in the very heart of Prague. Located within walking distance of Wenceslas Square and the Old Town Square. It is a great spot with easy access to all of Prague’s famous cultural sites, be it by foot or public transport. This lovely studio that belongs to the owner’s family is ideally located in the Old Town of Prague. The Astronomical Clock and famous Old Town Square are just 2 minutes from the apartment. Amazing apartment in the heart of Prague, situated in the quiet cobbled streets of picturesque Malá Strana. The apartment is on the first floor of a beautiful historical building, and is fully refurbished and tastefully furnished. This amazing, spacious, light and newly renovated apartment is located in a historical building just a few meters away from Charles Bridge. It’s lovely to be so close to the river. Within easy reach of lots of cafes, restaurants, galleries, and shopping centers. Just a few steps from and with a great view of Charles bridge, just opposite the famous John Lennon Wall is this very old renaissance palace with its own courtyard. It is a beautiful place, rich in history and romance, with typical sgraffito on facade and nice galleries. This 36 sq. m. studio is great for many reasons. It is one of the only two apartments in the whole street with a balcony facing beautiful historical buildings. This beautiful apartment with high and original painted ceilings from the 16th century is located 5 minutes from Charles bridge and within walking distance of all Prague monuments. It takes only ten minutes to get to Prague Castle. This apartment is simply the best of both worlds: being right in the historical city centre and offering the peace and quiet you deserve. Just 5 minutes’ walk from Prague Castle.